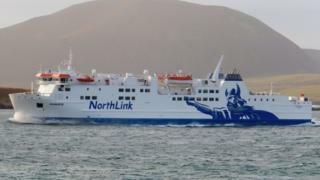 A transport union is calling for the Northern Isles ferry service to be nationalised. The RMT said the contract for vessels should be taken into public ownership, when the current one with Serco NorthLink Ferries on behalf of the Scottish government expires next year. The union said an online petition had already attracted hundreds of signatures. Transport Scotland said a policy review was being carried out. RMT general secretary Mick Cash said: "RMT members are proud to deliver this service for local communities and visitors. "The Northern Isles communities deserve lower fares, more frequent sailings and improved on-board services, on properly staffed and funded vessels. "We believe a growing and more reliable service can only be achieved through public ownership and operation and that is why we are launching this campaign." A Transport Scotland spokesman said: "A policy review, looking at the future procurement of Scottish government ferry contracts, is currently being carried out to consider the full impact of EU state aid rules. "We cannot pre-judge the outcome of the review. "However, should it conclude that it would be possible to apply the Teckal exemption and meet state aid rules then we would be minded to provide ferry services through an in-house operator, taking account of the communities they serve. "This would, of course, be subject to wider policy and value for money implications, as well as the views of those communities." The spokesman added: "We will publish a report on the review's progress to date in the autumn and aim to complete the full review process as soon as possible." Transport Minister Humza Yousaf previously said in February that ferry services in Scotland could be brought under government control if EU rules allow it.